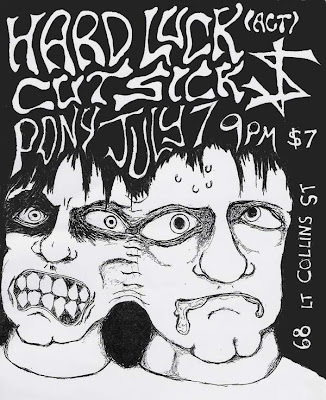 noise city: HARD LUCK, STRAIGHTJACKET NATION & CUT SICK!! HARD LUCK, STRAIGHTJACKET NATION & CUT SICK!! HARD LUCK(act), STRAIGHTJACKET NATION & CUT SICK!! After the recent changes to pub's, clubs and bar with the smoking policy, Pony greeted me with the smell of stale beer and bad body oder, kind of like what decomposing food would smell like. While walking to the venue most places now have people standing out in the cold with there death sticks. Very much of a click happening, people knew each other, sometimes this makes you feel a bit threatened. Yes there were a few people with there style that would fit in nicely with this type of music. The question I have is what the hell are you going to look like when your 60 with one of those big round earings that slot inside the lobe? Sets were short, maybe only about 20 minutes each, with the bands taking longer than that to tune. But who could complain with a front door price of $7. Only downside was that the Beer was $3.60 for a pot of heavy (the most I've paid for a pot at the moment is $4.50 at transport, across from flinders street station). Quickly (I'm no expert) Cut Sick had a great drummer; Straightjacket Nation was really into it and got the crowd into there music, had this energy; Hard Luck (from Canberra) kinda looked out of it, lead singer did a little pose with the taking of his jacket, and while this band played saw a few people leave with comments like 'See you at Bang' or some cool punk night for the kids. Garage Band site has some Straightjacket Nation tracks to download.